1500 p., 14,8 x 20,5 cm. 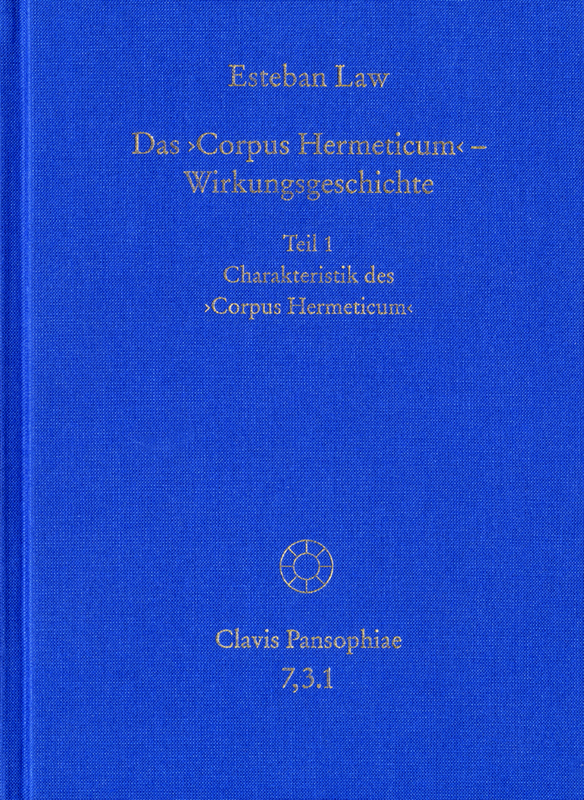 Das ›Corpus Hermeticum‹ im Rahmen der abendländischen Tradition. The theologico-philosophical wisdom of the Corpus Hermeticum is a crucial juncture in the history of the influence of ancient religiosity on the Western tradition. To date there has not been a comprehensive, systematic appraisal of the ancient parallel and reception tradi-tion as well as of the Latin medieval and early modern reception of the Corpus. Historian of philosophy Esteban Law fills this gap with the present edition, whose starting point is a methodologically grounded characterisation of the text corpus. The multi-volume work is aimed both at experts, in particular specialists in philosophy, the history of religion and religious studies, philology, theology and the history of science, as well as at interested non-professionals who want to learn more about the historical significance and fascinating nature of this body of thought attributed to the fabled Hermes Trismegistus.